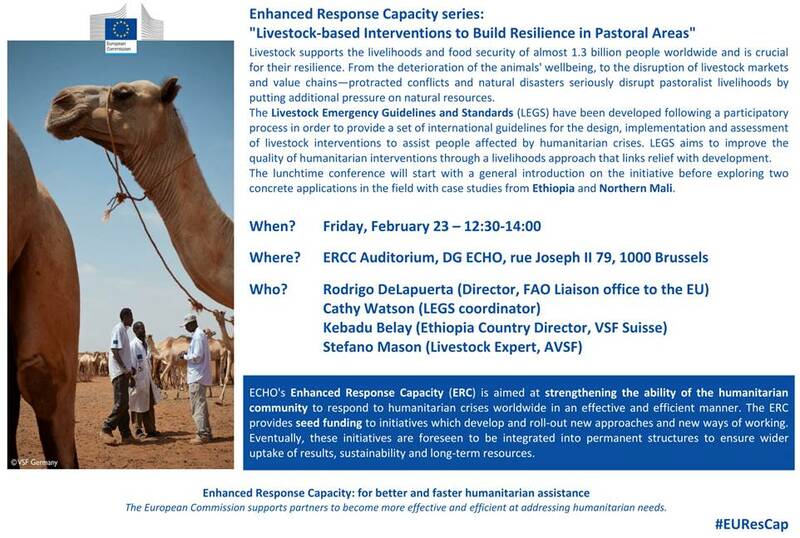 VSF International, the Livestock Emergency Guidelines and Standards (LEGS) project and the European Civil Protection and Humanitarian Aid Operations (ECHO) are co-organizing a lunch-time conference on 23rd February 2018 at ECHO headquarters in Brussels. The conference, titled “Livestock-based Interventions to Build Resilience in Pastoral Areas” is part of ECHO Enhanced Response Capacity series. Livestock supports the livelihoods and food security of almost 1.3 billion people worldwide and is crucial for their resilience. From the deterioration of the animals’ wellbeing and productivity, to the disruption of livestock markets and value chains—protracted conflicts and natural disasters seriously disrupt pastoralist livelihoods by putting additional pressure on natural resources. The Livestock Emergency Guidelines and Standards (LEGS) have been developed following a participatory process in order to provide a set of international guidelines for the design, implementation and assessment of livestock interventions to assist people affected by humanitarian crises. LEGS aims to improve the quality of humanitarian interventions through a livelihoods approach that links relief with development. The lunchtime conference will start with a general introduction on the initiative before exploring two concrete applications in the field from the VSF-International network, with case studies from Ethiopia and Northern Mali.